Carmun (of which I am a founder, etc.) is getting set to launch v2.0 of its student connective wisdom, yin to the Facebook yang, product. I believe that the web presents an opportunity for businesses to take fresh looks at processes, and then create value for users from outside the traditional parameters of those processes. Education, advertising, social media are just a few of the areas where many of these opportunities exist. I met Jon Bischke of Edu Rev last week and we were discussing how technology and connectivity (between people and ideas) are just now beginning to be applied in creative ways to learning and knowledge sharing. 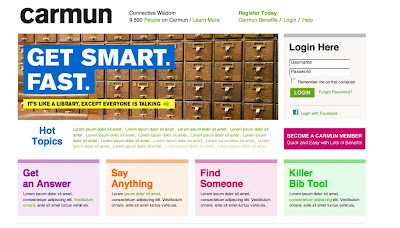 His company and Carmun are just two of a number that are trying to use the web to change that. We'll see what happens soon.